The media did it again. They took Pope Francis' words and made it seem as if the Pope "woke up" to reality, if you will. What did they do? 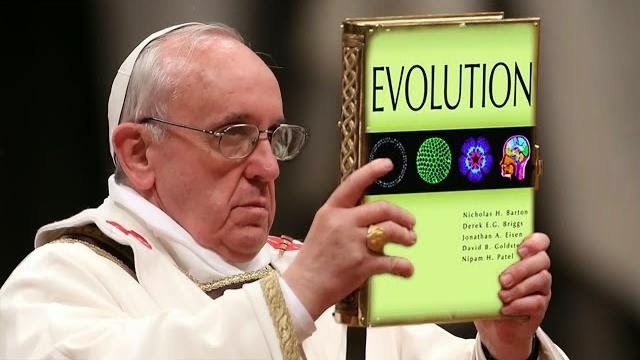 Well.. they took the Pope's words on the theories of Evolution and Cosmic Inflation as the Pope finally accepting science. Some news articles online even had a photo of the Pope with head held down and hand palms on face as if he was embarrassed or ashamed. The photo was used in order to convey the subliminal message, "the Pope finally admits science rules and he's embarrassed." Many atheists took to Twitter, Facebook, Google + and other forums to mock the Pope and make it seem as if they were right all along and that the Pope finally caught up. This is far from the truth and only demonstrates the ignorance atheists are plagued with which they circulate among themselves as if it were factual just to get a laugh or to troll Christians. What the Pope said is not new at all. 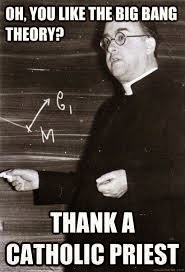 The Catholic Church has always stated that its teachings are compatible with both the Theory of Evolution and Cosmic Inflation, more commonly known as the "Big Bang Theory." Ironically, both theories were formulated by Christians! One of them (Darwin) wanted to be a Protestant minister, while the other was actually a Catholic priest (Georges Lemaitre). Atheists had NOTHING to do with these theories which they hold dear as their supposed "weapons" against religion and God. As stated, the Pope did not say anything new nor did he just realized that science has valid points. He was simply repeating what was already the position of the Catholic Church while honoring Pope Emeritus Benedict XVI. As the veil of the bust fell, which the Academicians wished to have in the headquarters of the Pontifical Academy of Sciences, in sign of recognition and gratitude, a joyful emotion arose in my mind. This bust of Benedict XVI recalls to everyone's eyes the face of our beloved Pope Ratzinger. It also recalls his spirit: that of his teachings, of his examples, of his works, of his devotion to the Church, to his present “monastic” life. This spirit, far from crumbling with the passage of time, will appear from generation to generation, always greater and more powerful. In regard to man, instead, there is a change and a novelty. When, on the sixth day of the Genesis account, we come to the creation of man, God gives the human being another autonomy, a different autonomy from that of nature, which is freedom. And He tells man to give a name to all things and to go forward in the course of history. He renders him responsible for creation, also so that he will dominate Creation, so that he will develop it and so forth until the end of time. Therefore, the attitude that corresponds to the scientist, especially to the Christian scientist is to question himself about the future of humanity and of the earth and, as a free and responsible being, to contribute to prepare it, to preserve it, and to eliminate the risks of the environment, be they natural or human. However, at the same time, the scientist must be moved by trust that hidden nature, in its evolving mechanisms, of potentialities that concern the intelligence and freedom, to discover and to act to arrive at development, which is in the plan of the Creator. Then, although limited, man’s action participates in the power of God and is able to build a world adapted to his twofold corporeal and spiritual life; to build a human world for all – for all human beings, and not for a group or a privileged class. This hope and trust in God, Author of nature, and in the capacity of the human spirit, are able to give the researcher new energy and profound serenity. However, it is also true that man’s action, when his liberty becomes autonomy, -- which is not liberty but autonomy -- destroys creation and man takes the place of the Creator. And this is the grave sin against God the Creator. I encourage you to continue your works and to carry out that felicitous theoretical and practical initiatives in favor of human beings, which do them honor. I now joyfully consign the necklace that Monsignor Sanchez Sorondo will give the new Members. Thank you." "We cannot read the accounts of Creation in Genesis literally. This will bring about many problems. In 1987, the United States Supreme Court ruled the teaching of Creationism unconstitutional... Evolution does not disqualify God as Creator. If anything, it shows the genius of God and how He uses natural processes in order to bring about life." There is nothing contradictory between both theories and the idea that God is creator. It does not contradict the Catholic faith. Both theories actually help prove the existence of an intelligent being whose purpose was to create a universe with specificity and order. The Church gave us science as we know it today, so it would be silly to give false impressions that the Pope just "discovered" evolution or the big bang theory as being valid, real and true. As for the "God/Magic Wand" thing, I am assuming the Pope made this comment in response to the caricaturing of God done by new atheists who often describe Him as a "Sky Wizard." The Pope is making it clear that atheists got it wrong (as usual) and that Creationists are in fact harming Christianity and the accounts found in Genesis.